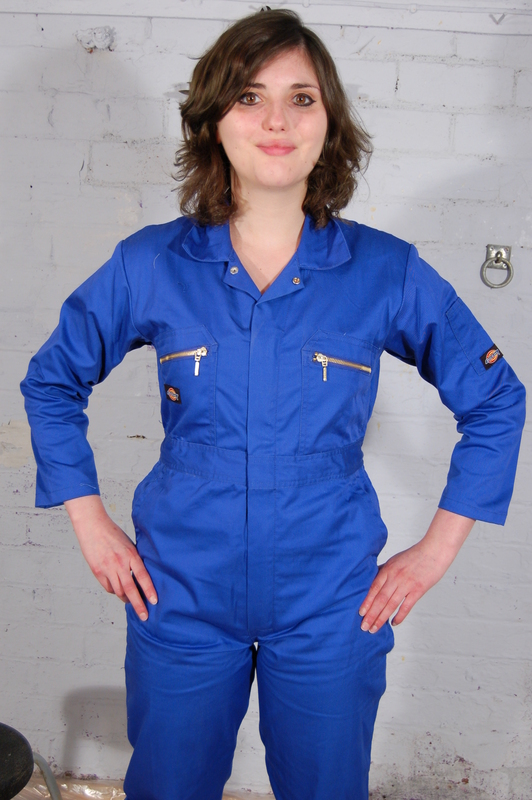 Maude's Blue Boilersuit Art - Our lovely chamberwench makes an artwork of herself! Our lovely chamber-wench makes an artwork of herself! Maude, at just 19 the youngest of the Hall's chambermaids, likes condensed milk. She especially likes the feel of it on her skin, which is why her brand new, spotlessly clean and dry royal blue uniform boilersuit doesn't stay dry for long, as she starts pouring cans of condensed milk in at the neck, from where it floods down inside and soaks its way through the pristine fabric. She likes custard too, and soon fills one of her back pockets with thick yellow gunge. And then she sets about herself with treacle and syrup, and very quickly her once-clean suit is drenched as she pours more and more gunge down her front while sitting on the dungeon stool, allowing the mixed mess to flow down over her legs and trunk. Once the front of her suit is well drenched in goo, our young artist finger-paints patterns on her cheeks, before giving herself a very thorough custard shampoo, really working the custard into every strand, after which she gives herself a treacle facial, and then tops off her custard shampoo with a large can of treacle straight over the top of her head! The gunging continues, as she steadily reduces herself to a wet and sticky mess, before she takes to the gunge-covered floor and writhes about in the pool of mixed milk, custard, treacle and syrup. She makes gunge angels on the floor, rolls onto her front, pressing her already drenched suit down into the gunge, and then rolls onto her back again, and relaxes, utterly drenched in mess. Finally, she stands up and finishes herself off with two large bottles of cola, one over her head, one down the front of her gunge-soaked suit, and then takes her wellies off and pours their contents down herself too. Now that's what Lady Jasmine calls art!